The purpose of this tutorial is to explain the steps to activities involved in setting up the Mails from SAP. The steps are common across SAP R/3 as well as SAP new dimension products like APO, CRM, BIW where the SAP Kernel 620 and above is used. Following activities needs to be performed step by step to activate the mail from SAP. Step 1.1 SAP System Profile Set-up: Set the Instance Profile (RZ10 transaction) to allow SAP to connect to external SMTP servers. 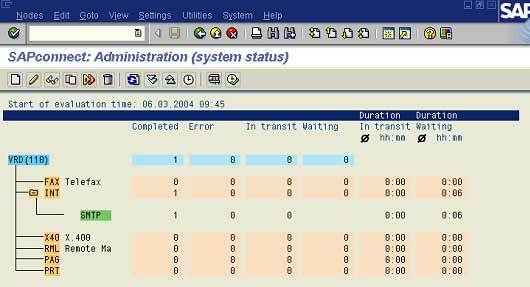 Access the transaction RZ10 for set-up the profiles parameter and Select Instance Profile. Alternatively we can use the menu path Tools - CCMS - Configuration - Profile Maintenance. After setting the parameter or changed the value in the SAP profile, restart the instance to update the new value. To activate and configure SMTP node Mail communication configuration needs to be done via SCOT transaction and alternatively one can use the menu path Tools - Business Communication SAPconnect. Access the SCOT transaction (SAPconnect Administration) and then from Settings menu, select Define Domain. The Internet Mail Addresses dialog is being displayed. In the Default domain field, type the company's email domain (for example, mycompany.com) and click the confirmation button. Default Mail domain is set using the menu path Settings - Default Domain. Under Supported address types, click the Set button next to the Internet checkbox. The Address type for node dialog is displayed. In case the Address area box does not contain an asterisk (*, meaning that all addresses are permitted), make sure that the email address "send@letter.postalmethods.com" is permitted for outgoing emails. Under Output Formats for SAP Documents, from the SAPscript/Smart Forms drop-down menu, select PDF. Click the confirmation button. In SAPconnect: General node data, click the confirmation button again. From the View menu, select Jobs. If there is an existing job of the variant SAP&CONNECTALL, a job is already scheduled for sending outgoing emails. Skip items 3 and 4 and move forward to Step 1.4. Type a name for the job. Select the SAP&CONNECTALL job variant. Select the option Schedule Periodically. Specify a reasonably short time interval (for example, 10 minutes). Users will need to wait for this time interval before their letters are sent. To Configure Address Area you have to Click pushbutton against the internet and screen will be displayed as below. Enter “*” in the address area and Press enter which will take the control back to the main screen. Press enter again to complete the SMTP node configuration. Mail confirmation set-up needs to be configured other wise mail will be always on waiting to deliver state. Use the menu path Setting - Confirmation of Receipt. Make the settings as displayed in the above screen and press . Execute the SICF transaction and double click on the SAPconnect node. Press the enter “0” in the profile parameter no. Select the entry and save by press. Select the entry and save by press . Select the SAPconnect Node and user the menu path Service/Virtual Host - Activate. System will prompt for confirmation. Press “Y” to activate all nodes below. Send a test mail via transaction SO00 or using menu path System - Shot Message. The following screen will be displayed. Send the mail by pressing icon or using menu path Document - Send or by pressing. Now the mail will send to the recipient. Execute the SCOT transaction, the below-mentioned screen will be displayed, indicating one mail is waiting for delivery. If you scheduled the mail delivery program then mail is delivered on a specific interval. To test the mail press the push button and enter the address area “INT”. After the successful execution of the step the following information is displayed in the SCOT transaction screen.